A couple of pictures of an SW1500 no 1318 wearing the UP livery with Mopac lettering which it wore for a short time. 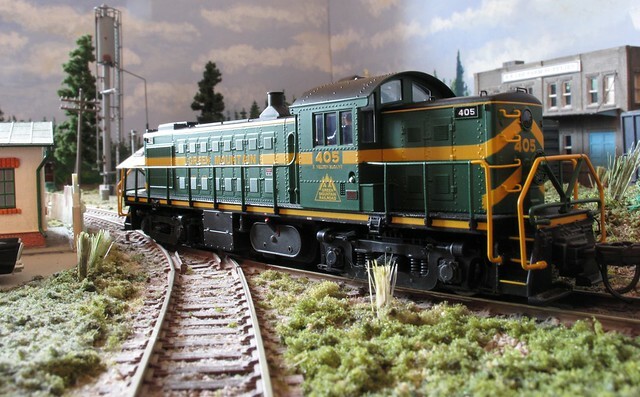 The model is an early Athearn that has a fully detailed cab and was made by the late Mike Scott. I bought it from him some years ago at an NMRA meet. The switcher is seen working the yard at Colonel’s Crossing having brought in a train from Hope AR. I read somewhere these locomotives could be very hot to work in during the Summer due to the large area of glass, a bit like a greenhouse I should think! 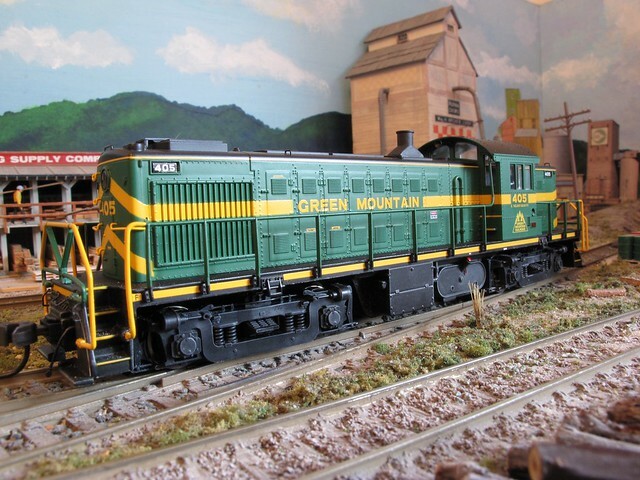 This beautiful Green Mountain Alco RS1 is another of Andy’s models this one is not DCC fitted. He bought it when on a visit to the states. I think the livery suits it very well. She runs as well as she looks. In the first picture she is seen in the yard at Benson, the scenery could be anywhere really. 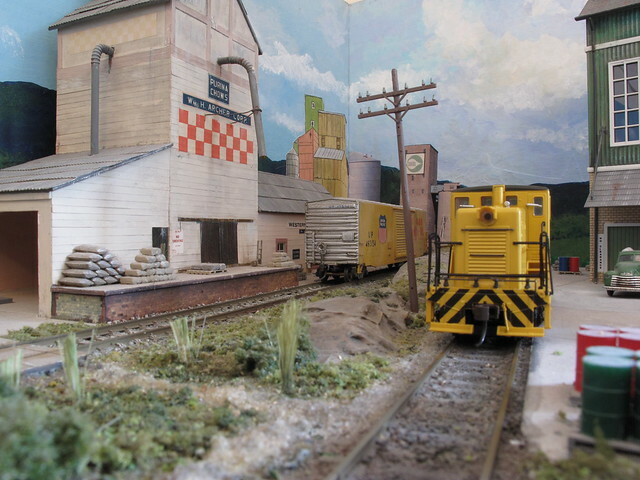 In the second shot she is just leaving the flour mill head shunt behind the service station. You will all be able to breath a sigh of relief as we are nearly at the end of the ramble. A picture taken of an Ashsley Drew & Northern CF7 picking up a load of pulp wood flats from Benson east yard late in the day and then departing. She is now dirtier than in some earlier pictures she had taken. I often do this, a little work staining at first then after a while I add a little more weathering. It looks more natural that way I think. Well folks this is it we are at the last photograph. 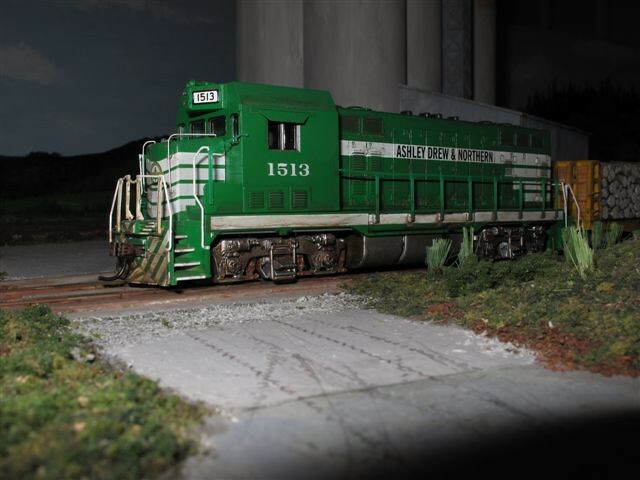 Here we see the AD&N no 1513 at the back of the Trisco Flour mill, a view you can’t normally see as it is taken from the back of the layout with the camera on the track. I must admit I rather like the CF7 and so did many real short lines. I was told that in reality that they were not very popular with their crews being draughty and uncomfortable. That is the thing with a model we are able to run what ever suits us. I regret I no longer have this photograph. That's a awesome little layout Peter!!! Thanks for sharing the photos and story with us. Thanks for the kind words Ken but Andy took the photos, I only made the coffee. I’m sure he will be up again and he always brings his camera so I’m pretty sure there will be more pictures. Surely you didn't think we wouldn't spot it...?!? Pete and other devotees of the Forum. Many thanks for all the kind comments regarding the pictures I have taken of both the Interstate & Western and the Sisters Farm. Peter does make resonable cup of coffee. First let me say that a $1000 camera will not improve a 2 cent layout (hope I have got the meaning ok). The layout, though not big by some US standards, has numerous small scenes that are allways interesting to photograph. Years ago I was fond of a British magazine called "Model Railway Constuctor", now long since gone. 1. The magazine mixed British with non-British articles. 2. The staff photographer, sadly I can not remember who, concentrated on taking photos from "ground level", trying to recreate little dioramas as if he was standing there. This second point always made me think "I could do that" as only a small portion of what may (or may not) be a large layout was visible in the photo. 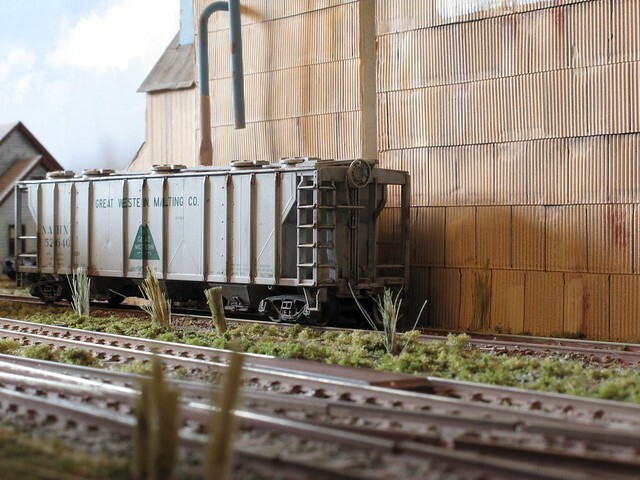 If I may, I would like to offer some tips to any one considering taking some pictures of there layout. If they are rubbish, put it down to the ramblings of an idiot and you won't be far wrong. First the camera. I use a small compact that has manual settings and a macro function. Turn the flash off and set the the aperture as small as you can. You will need a tripod, or put it on a flat surface on the layout, or perhaps a table next to the layout. Raise it up with books so that the lens sticks just above the baseboard. Most compacts have a self timer, so use this to stop camera shake when you fire the shutter. Get down low (Sorry Pete your bored with me saying it). Imagine you are standing there by the track building etc, not flying in a helicopter. I can't afford to do it and I am scared of heights. Try to keep the forground clear, the camera will focus on the loco or freight car etc, not on the vehicle in front which will throw the loco or subject out of focus. 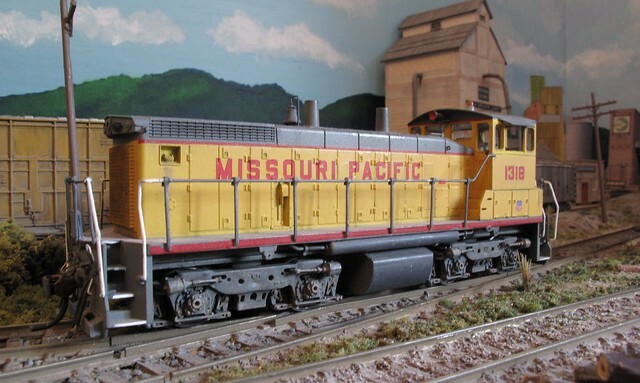 If you use a compact, try puuting in on the layout so that you get a view that you (the owner) don't often see. Try taking a photo into a mirror. Position the mirror somewhere its difficult to get to then use a cheap paint program on the PC to "Un Mirror" the image. Allways try to have some control of the light. 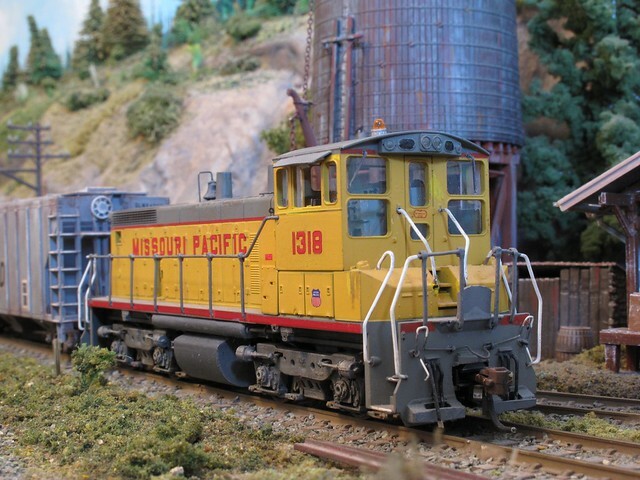 Try taking pictures of your layout at night using a reading lamp or a large torch to illuminate the subject. Have a look at the shadows and try to make them like a real photograph. Copy the angle etc out of a book of your favourite pictures. A digital camera with a back screen will show you what it sees and you can easily throw a bad picture in the bin (and no one will know!). Above all, try to make out you are there. Where would I go to get that picture of the shortlines lovely GP7 in the sparkle colour sceme. For those fans of Andy’s work I have found one more more unpublished photo taken on his last visit. I hope you enjoy them. We are going to want to see more!!! I have found one more from a previous visit. The yellow 44 ton beast is self explanatory.